This past Saturday night, I found myself standing in an ocean of burnt orange as it was the first UT football home game of the season. 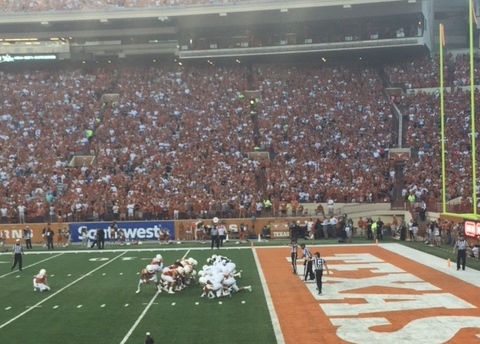 Having attended a university without a football team as an undergraduate, I was eager to experience a UT game since my acceptance to the MPA program and I was not disappointed. 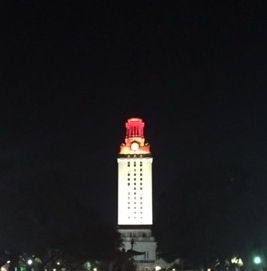 Obviously, my enjoyment was enhanced by the fact that we beat the Rice Owls 42-28, and the Tower was lit orange in celebration. My favorite part of the evening was attempting to learn the words to the crowd’s chants and then the appropriate time to sing each one. I was successful in getting a few of the songs down at the right time, but I was mostly just good at yelling when our defense was on the field. My voice was a bit horse on Sunday morning as a result. If you ever consider going to a game, I recommend checking out the chants before you go, however it was fun to attempt to learn them with the other MPA students. As students, we are offered what is called the “Big Ticket,” and for $175 (this year’s rate) you are given admission to all UT home football games as well as all other UT sports throughout the year. As graduate students, we have second selection (behind current seniors) for seat placement at the stadium, so we were placed in the sixth, seventh and eighth rows on the northern goal line. The view was pretty fantastic as seen below. 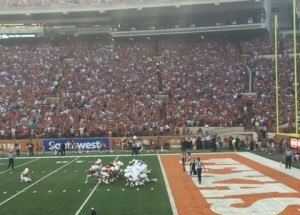 My first game was an excellent experience, and I am so glad I made the decision to buy the Big Ticket. I look forward to attending the rest of the games this season. Hook ’em.